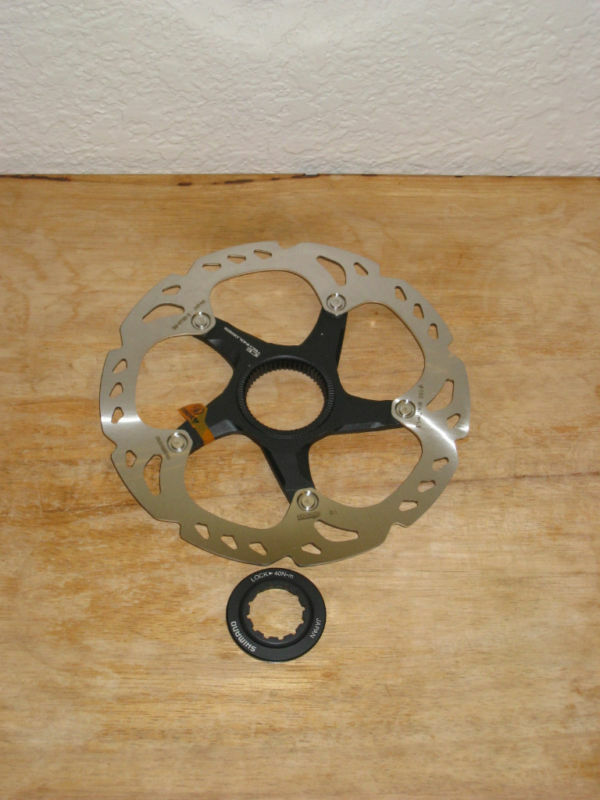 Ritchey Annapurna – Help needed + Power! It was a very nice find for me. 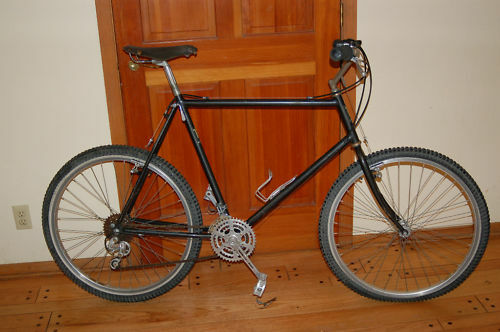 Just my size, cool color and Rocky Mountain heritage too – it was an export model. Some horse trading later and the bike was on its way to me. It arrived well packed and I rushed to set it up. A little while after the initial rush, I noticed that the bike was “crying.” Not a good sign. 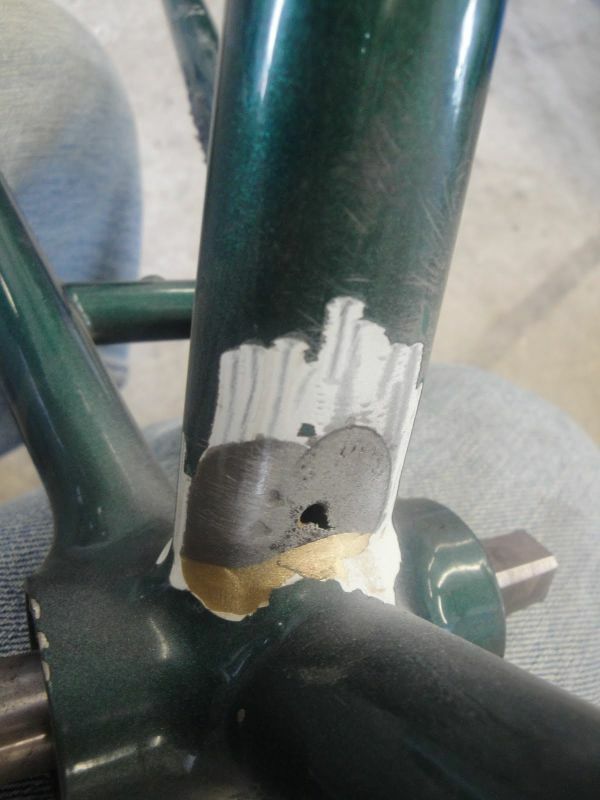 Closer inspection showed some paint bubbling around the bottom bracket. I poked the bubble with a pin, gently, and disturbingly, it easily penetrated the metal and some water came out. Ugh. I reached out to a number of framebuilders but Rody at Groovy Cycles was the man most interested in the job. Rody is an accomplished framebuilding in his own right, and has refocused his efforts at custom frames and components, but he has been tempted by interested challenges. This project tickled his interest. 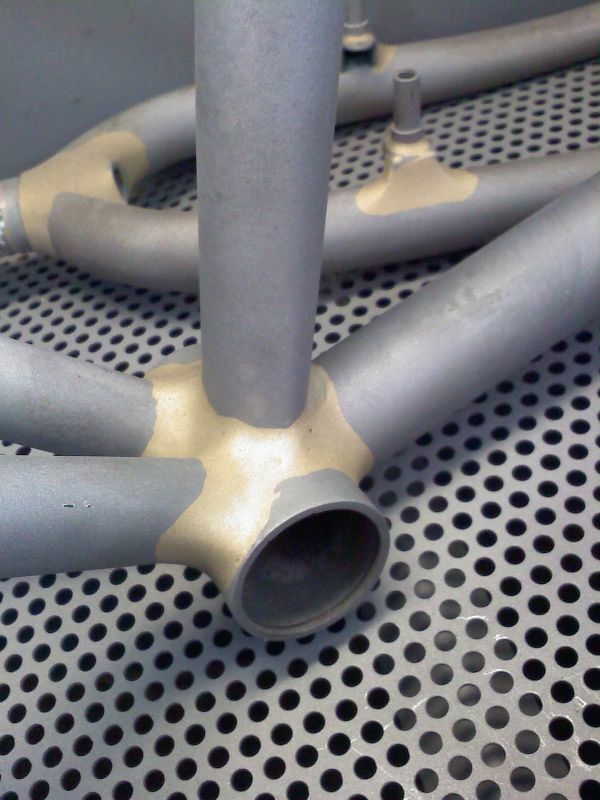 Rody’s plan was to cut the tube in half and to only replace the bottom, recreating the fillet brazed at the bottom bracket juncture. The center of the tube would be connected by TIG welding. When the paint came off Rody identified 11 other compromised areas that he set about fixing. He is truly a classic bikes saint. Now the tube has been replaced, holes have been patched and paint is ready to be laid down. The recreation of the bike will be pearl white. I am really looking forward to it. But fortunately, there is a solution. Every year I get so wrapped up in the Tour. Another wonderful year. And if you aren’t reading the Tour de Schmalz, you are missing out. 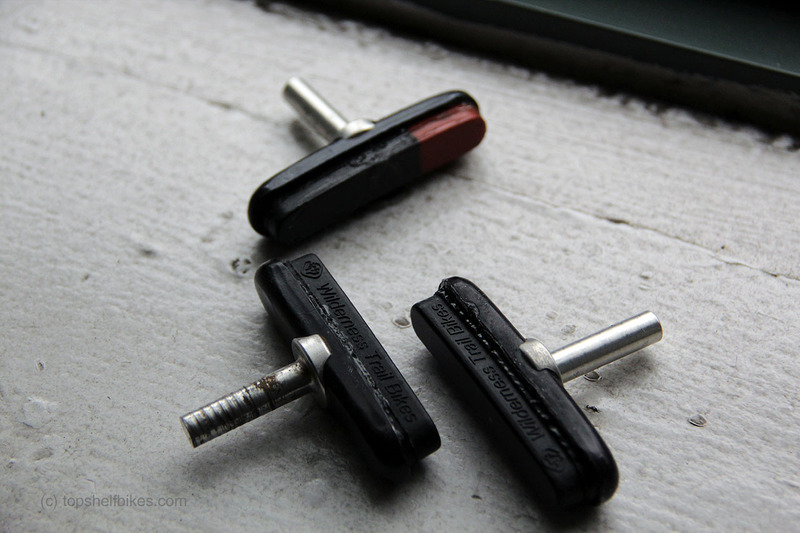 Like everything that the old WTB did, their brake pads set the bar well above any conceivable peer. 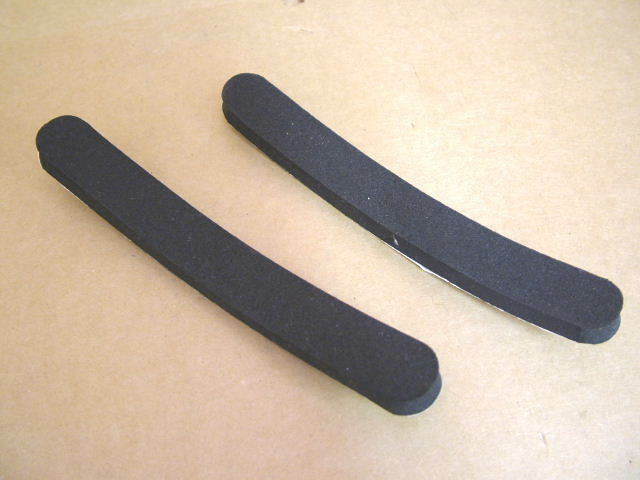 The pads were available in three different compounds – salmon, which was for rim conditioning only, was coarse and removed anodizing and smoothed the braking surface; black, was a high-quality compound manufactured by Kool Stop; and mixed had both salmon and black compound, but the salmon appeared to be much less harsh than the full salmon pads. 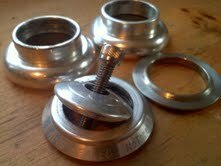 The holders were a three part affair machined from aluminum. The post was epoxied and bolted on to the pad holder. 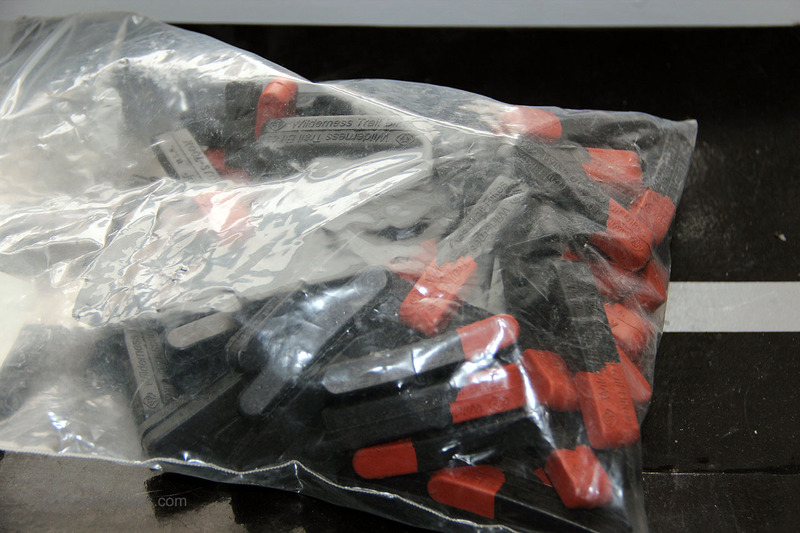 Pad holders were available in a number of colors, including black, gray, blue, silver electric blue, purple and red. 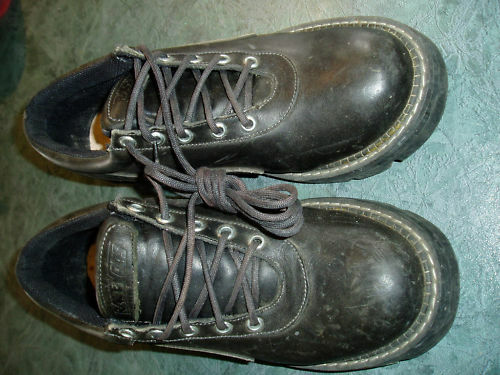 The design permitted users to replace the pads after they had worn out. The other day I did just that. 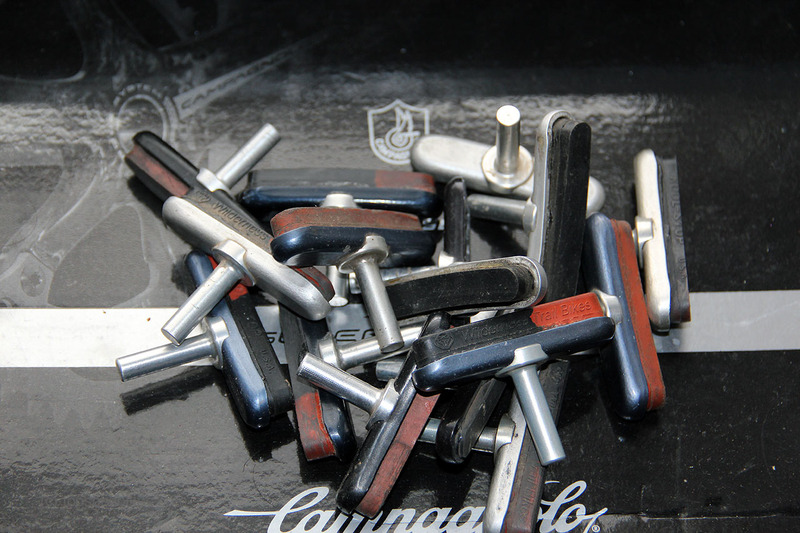 I had been lucky to be able to source a lot of pads – and the WTB tool used for setting them. I have a bunch of pads in various stages of wear, but a few really needed to be fixed. One pair had been worn down nearly to the pad holder. The other had been installed backwards (so the salmon and black parts wouldn’t match up on a bike). 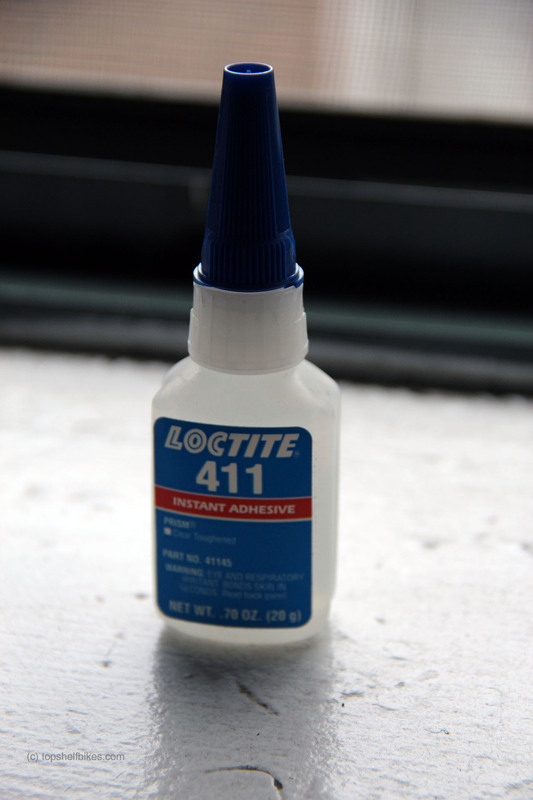 The adhesive that came with the WTB tool had long since dried out. First step was to find a replacement. Turns out that industrial super glue does the trick. This stuff is pretty nasty. I got a little on my fingers and it burns. Doesn’t really come off either. 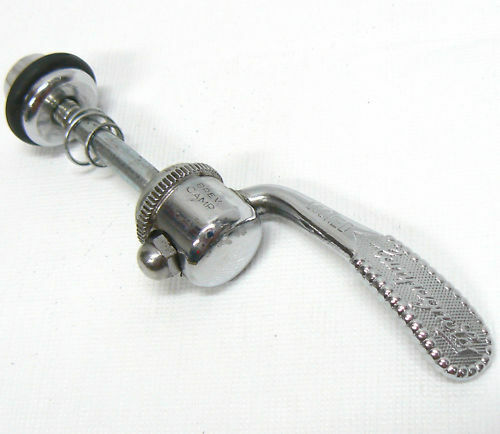 The pad installation tool is a pretty simple clamp – its main purpose is to apply even pressure to the pad inserts. 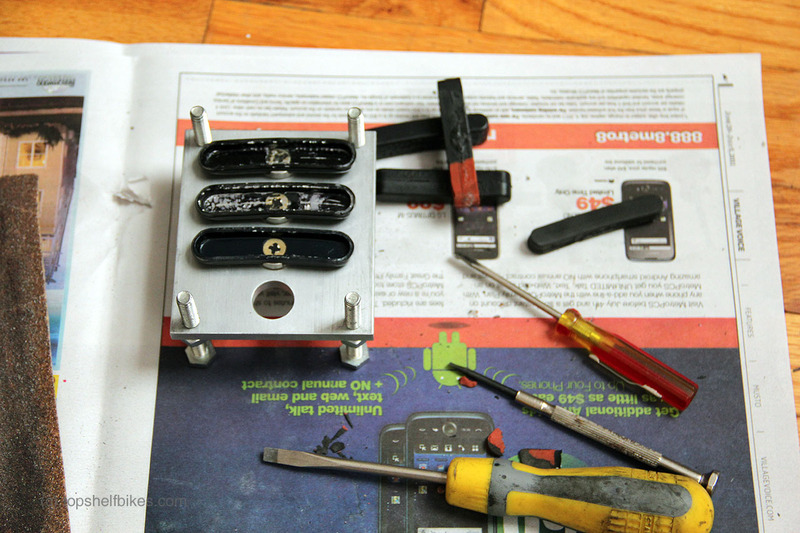 Pulling the old pad inserts out required a lot of prying with screwdrivers. After prying the pads out, I removed old dried adhesive with a screwdriver and an X-acto knife. I should have used some industrial solvent as well but didn’t have any. 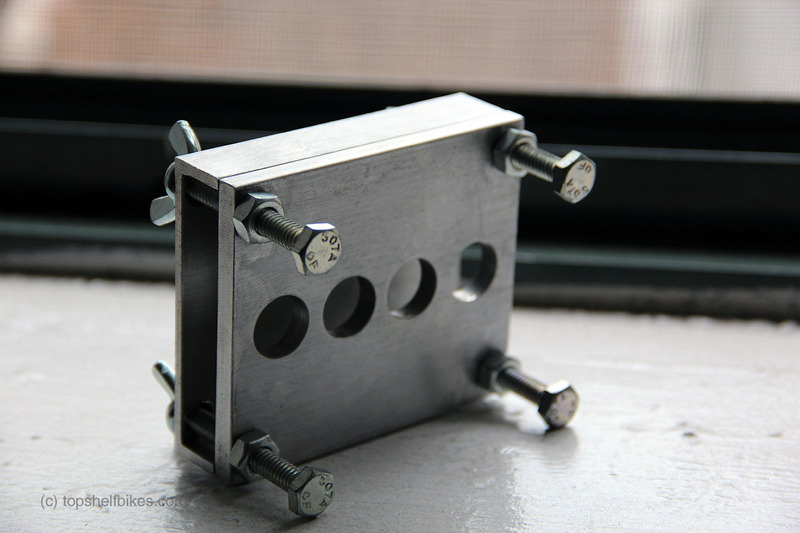 The amount of adhesive originally applied caused the differences in anodizing that came off. 0.01 or 0.02 fluid ounces of adhesive should be applied into each pad holder. If there is too much it can get messy. I put a bit too much, having no real idea how much 0.01 or 0.02 ounces looks like. After applying the adhesive, I clamped down the pads to let them set. After letting the pads under pressure for a little more than a minute, I took the pads out and let the adhesive cure overnight. Next time I will use less adhesive. I am finishing up work on a steel phoenix that has been a delight for me. I had a logo’ed Chris King headset on it, but was happy to pick up a classier no-logo headset. While bikes and parts are my main thing, I do like soft goods too. 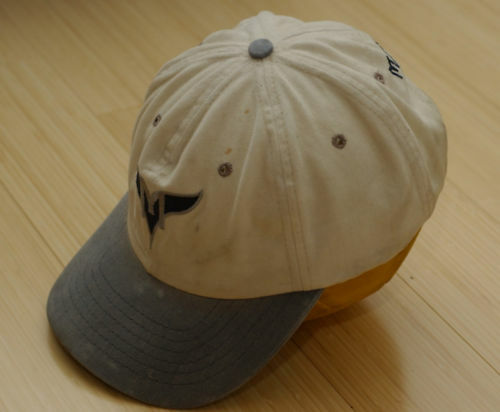 This nicely used Mantis cap was a cool find. 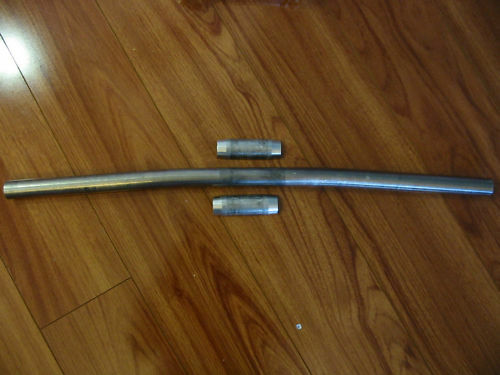 WTB Ti bars are always nice to have, particularly in a decent width (23 inches) and with the Steve Potts tapered shim. 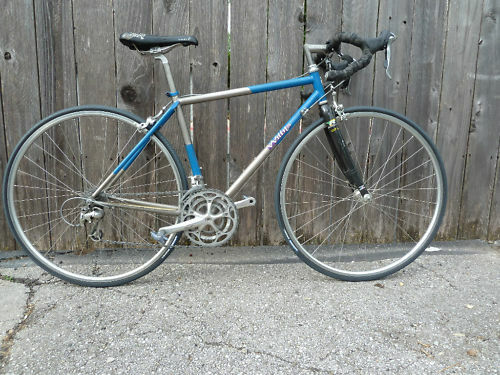 Last, but certainly not least, very happy to get this Willits titanium road bike. 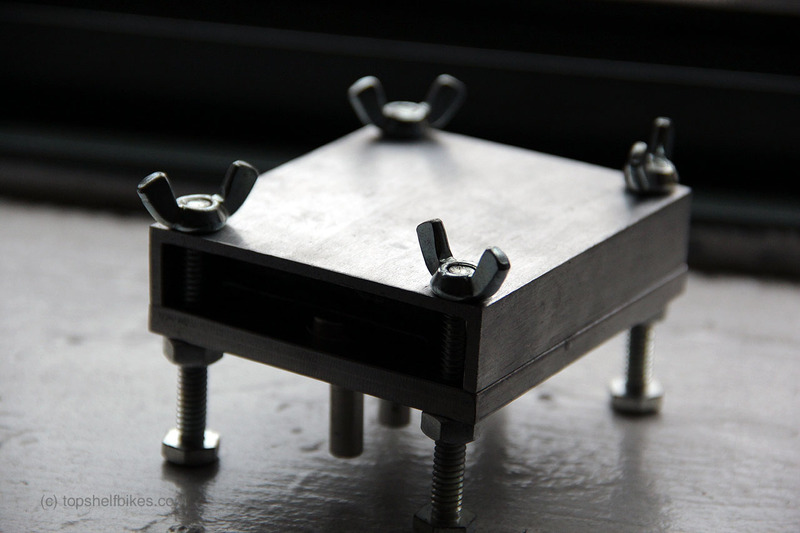 It is a little smaller and so I plan to set it up to fit with a steel bar and stem. The Mantis Pro Floater is one early suspension mountain bike that I kind of like. The aggressive lines carry over from the Mantis rigid bikes. I am given to understand that the suspension wasn’t terrible for the time either. 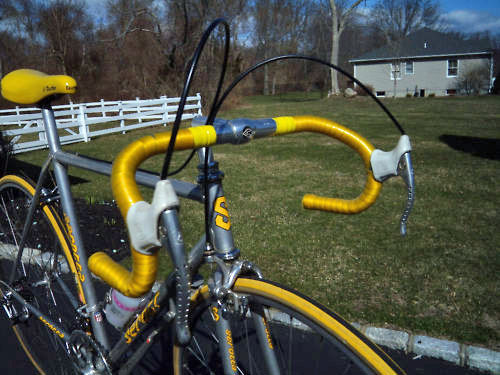 The Pro Floater is also a perfect canvass to hang early/mid 90s bike jewelry. This model is from 1993. Ten years earlier, this is what the state of the art looked like (unless of course you were peeping a timeless Cunningham). 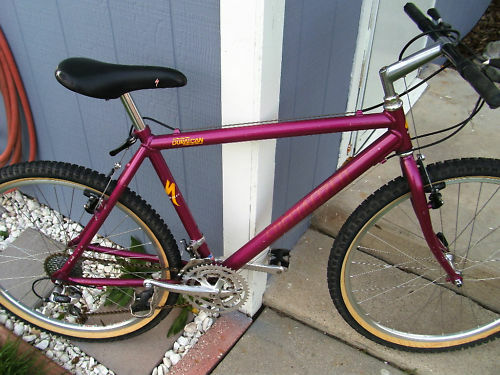 Ritchey Mountain Bikes (the “R” series) were only made for one year and after that year Tom and Gary parted ways, crystallizing into the Fisher and Ritchey brands. 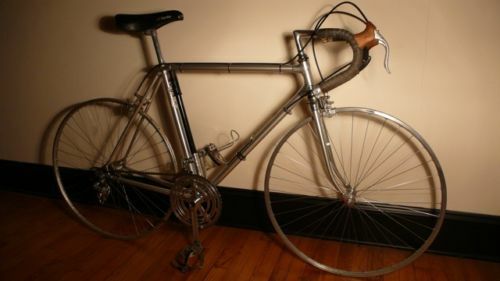 This bike is nearly bone stock and will likely be used for parts – I’ve got a mint Ritchey Moutain Bikes frame with the nicer biplane fork that is in need of period parts. 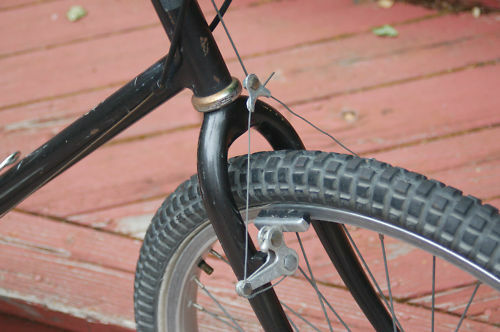 In the early days of mountain bikes, pioneers would cut down Campagnolo road wheel quick releases to make seat quick releases. I was pretty psyched to find one of these little beasts. 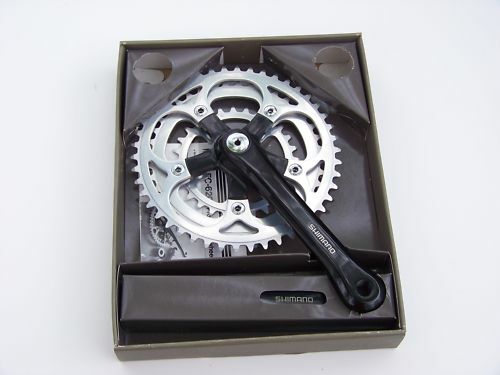 Black NOS (NIB indeed) Shimano 600 EX 110 BCD cranks are … tasty. Tasty dirty. 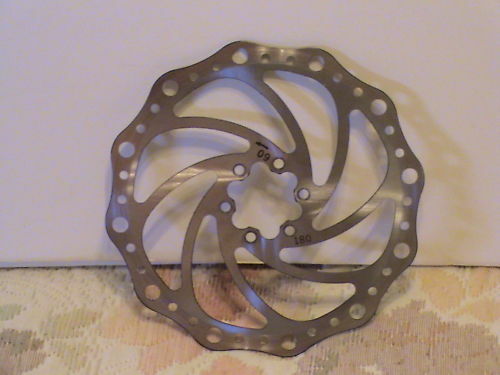 Finally, I am going to find out if a 180mm rotor brakes better on the front of my Turner Sultan than the 160mm I had. New York has been enduring a cool and wet spring. This doesn’t seem to phase many of the people I see riding. I suppose they don’t mind dealing with the aftermath of a wed and muddy ride. Many have a preference for indoor training which allows a more focused work-out, particularly when training with a coach and/or with power. As I have previously written, I ride for fun and train to be less fat, so doubling my riding time by adding cleaning time and grinding out miles on the trainer are not for me. Consequently, I am not quite as fit as I’d like to be. Still, May is nearly upon us and I have big things in May. May hosts two of the H2H series races, the Stewart 6 Pack (a 6 hour mountain bike race), and the Gran Fondo NY (160km on the road). For better or worse, my fitness in May will be tested. While I am not doing everything I can for the engine, the rest of the machinery is getting the treatment. 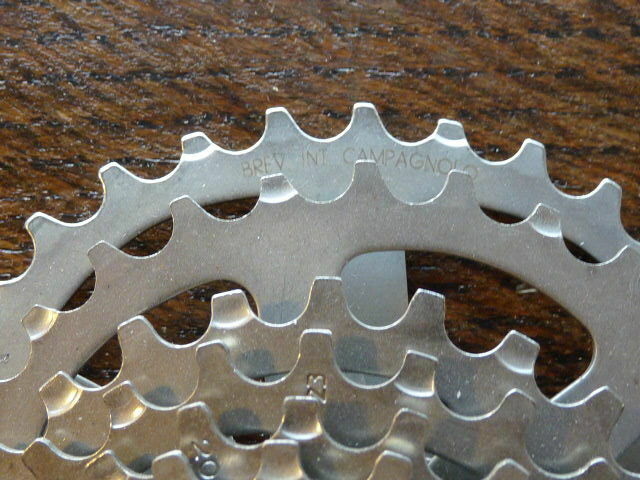 For the Gran Fondo, I am planning to run compact gearing. The ride will have nearly 7,000 ft of climbing, a large percentage in the final third of the event. With an 11-25 on the back of my Moots, I am thinking that the 34t fallback will be appreciated. Additionally, after trying some of the old school Specialized carbon(ish) road cages, I am switching to the King Ti cages for the ride. I don’t want to be losing bottles. For the off-road events there is a lot of change. 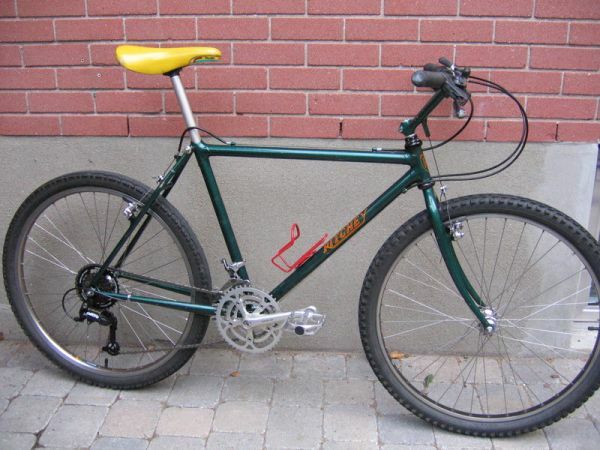 I sold my 2008 Intense Spider XVP and am moving most of the parts over to a similar vintage Turner Sultan – 29er sussy, yo! In the spirit of overkill, I am also working on a modded Ti Phoenix (26er), a full rigid Potts Ti 29er and a Moots Mooto-X hardtail. For the May races, however, the Turner will be the bike. 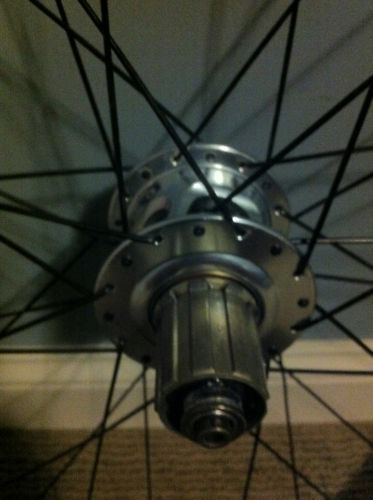 Sids Bikes is building up wheels with Stan’s Crest rims and a mismatched XTR DT Swiss hubset. I discovered that my rear brake hose was going to be too short as well. Brake stuff was needed. 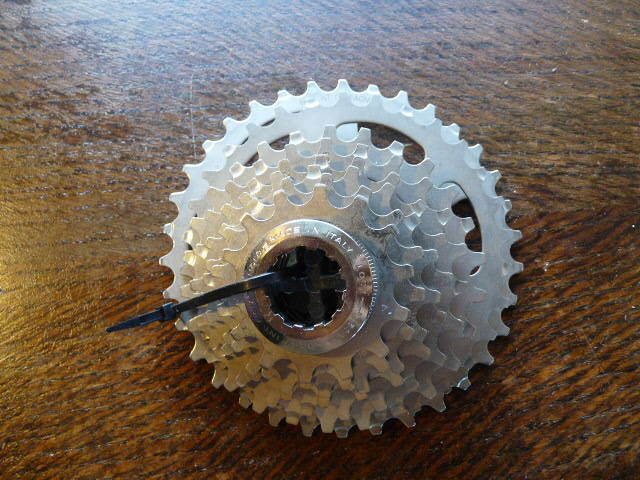 First I picked up an XTR Centerlock rotor (classic Shimano smart but proprietary). 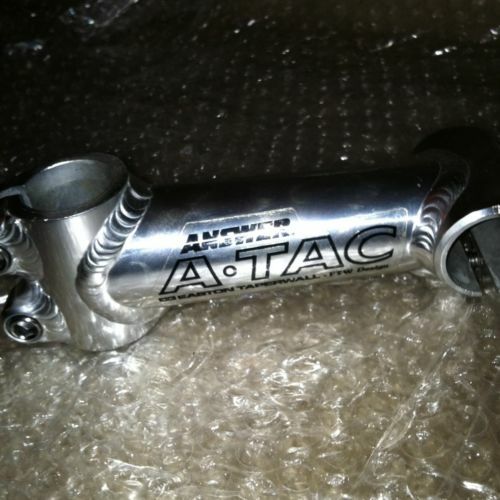 Finally, I still have too many classic bikes and so couldn’t pass up this 1 inch threadless Answer ATAC stem. Handy when you need it! 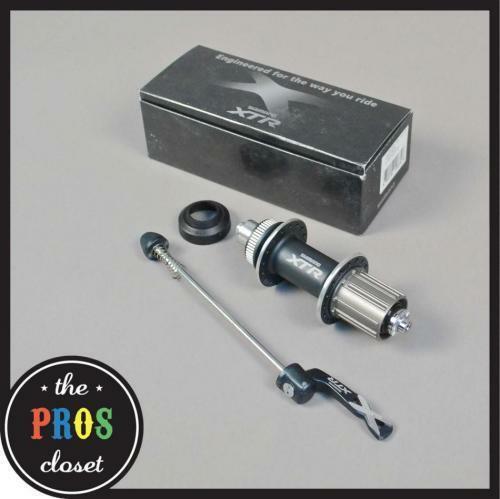 Assorted Stuff – XTR, Fluevogs, Serotta, PD T-100 and More! 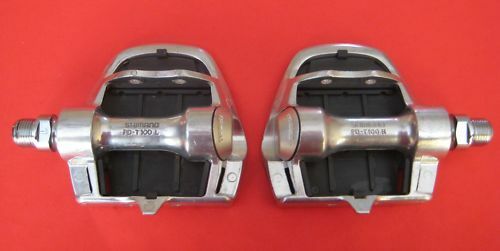 For a brief period Shimano made a very ugly but very good platform/toe-clip pedal – the PD T-100. The name designated these as Shimano’s triathlon offering. I have big plans to have this set modded up. I need to get some Christophe toe clips and some Binda straps to get ‘er done. At some point two Vancouver, B.C. company’s got together to make these shoes – Fluevog for the Canadian-Alt styling and Race Face for the mountain biking know-how. And so, the Race Vogs were born. These are kind of blemmy but maybe can be fixed. From Jasper too. Not so clear from the picture but these are SPD compatible. 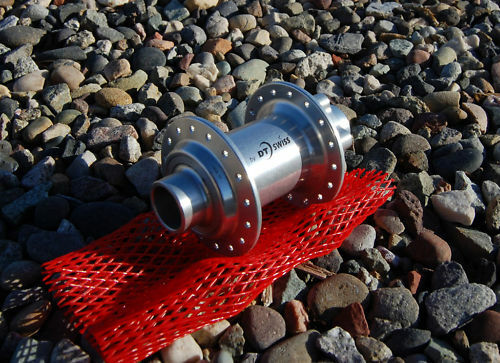 I don’t know why you don’t see more Shimano hubs in use. They are so great. This XTR M975 rear is currently being built up with some Stan’s Crest 29er rims. My Turner Sultan is impatiently waiting. I am curious to try Shimano’s funky discs. 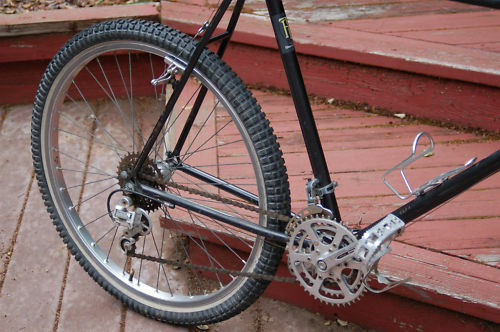 The bike uses a 120mm Manitou Minute fork in the front which means a 20mm Thru-Axle. 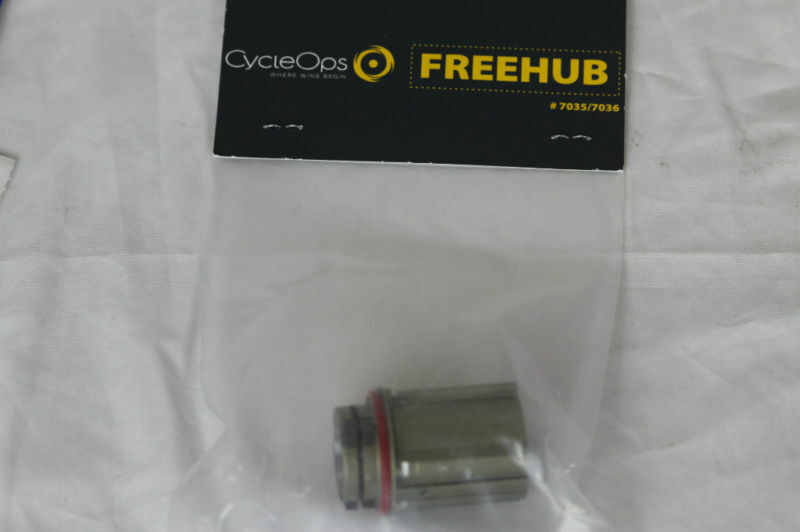 I split the set and am going to use this DT Hayes hub on the front. 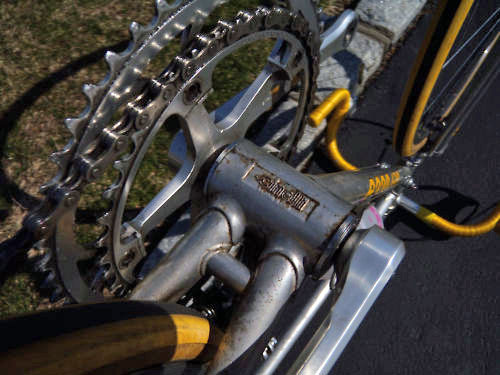 Back in the day Sedis chains were my favorite and I regularly went with the inexpensive and long-lasting GT7. 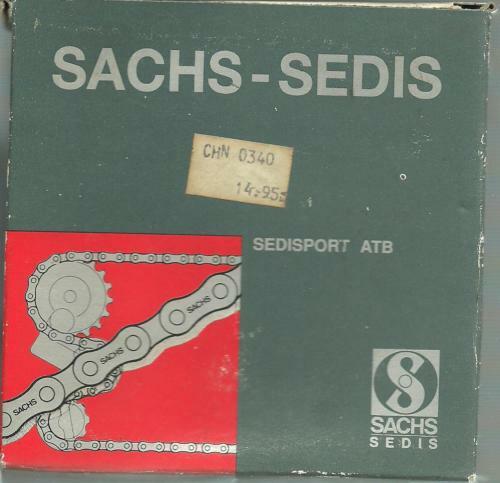 Sedis chains (an indeed consumables generally) are spendy now so I was happy to chance upon this Sedis ATB chain with a decent price. The chain is now installed on the Cunningham Wombat that I have been restoring very slowly. I am also thinking of retaping the bars on my Cunningham Expedition. I have some funky 80s silver vinyl tape but age has caused the adhesive to degrade so it is more of a lube – the tape kind of oozes around on the bars. In any case, black cloth tape would look better. I want to have some strategically placed padding on the bars though. These weird pads might be the ticket. 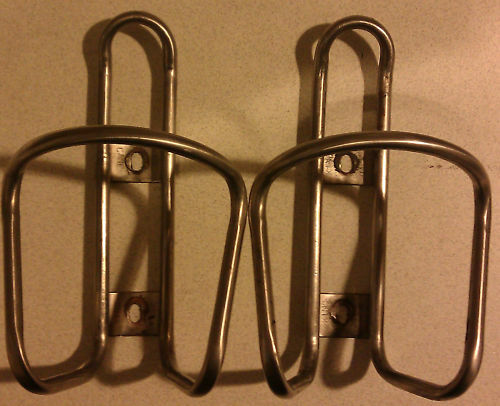 Marketed as a Cinelli product but these have no markings to indicate whether that is true. 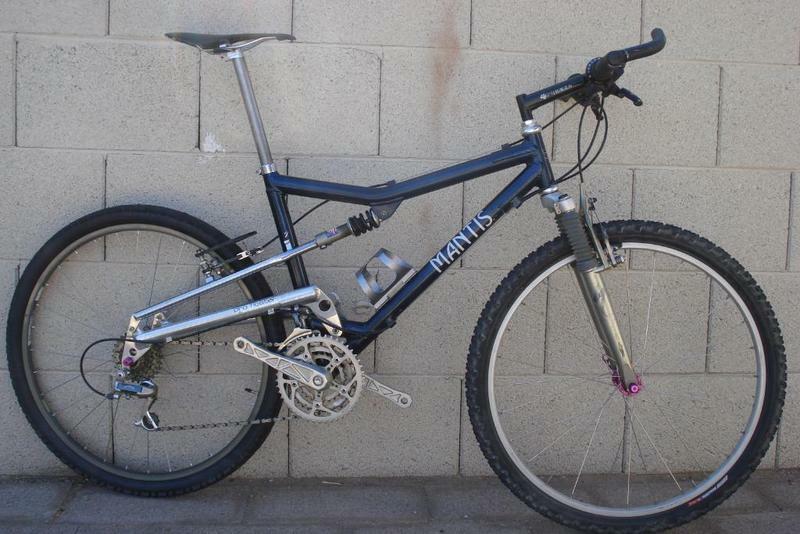 Although my bikes tend to be unobtainium, I have always had a soft spot for the Duralcan Specialized bikes. I thought they looked smartly put together bikes. I have heard that they ride really nice too. So … an M2. Serotta bikes are one of those rare makes that have been able to persevere. 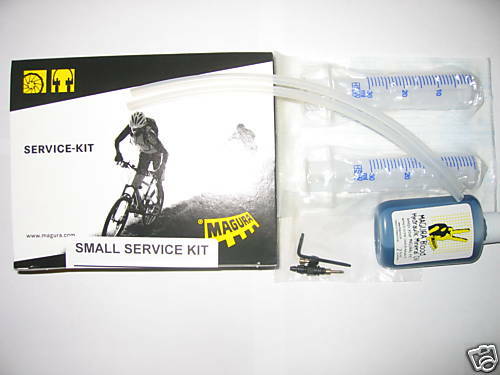 Make no mistake, the bike industry is a particularly hard one. And while Serotta bikes today offer the full range of high tech, high zoot options, this Super Record equipped road bike is all old-world craftsmanship. After being shelled (for no good reason) early in this morning’s power sprints 60km race I have been feeling philosophical about bike riding. The fact that the day has been cold, gray and threatening from the crack of dawn through now, with the additions of the the skies opening up from time to time and flashes of lightening and thunderclaps. I mean, c’mon, I’m fat and out of shape, its early and the weather … is … not … cooperating. More than that, how much do/can I care?! My first bike race was many many moons ago. My bike wasn’t even close to fitting me. In a bizarre attempt at planned optimization I “repacked” all my bearings with Phil Woods Tenacious oil. Light weight necessitated the absence of a water bottle. Although objectively a disastrous outing, I had a great time. 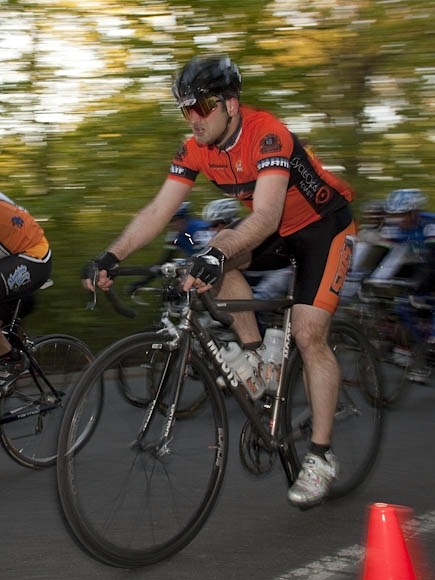 There was a time when I was a serious racer in that I could legitimately contend at the amateur locals races I entered. Heck, I even won some. Fast forward to now and my primary goals are to avoid (i) injury and (ii) humiliation. As has been the case too often lately, this morning saw a failure on the second goal. But still I am chomping at the bit for more riding and more racing. Over the course of my racing life the business of training has become much more serious with heart rate monitors, now power meters, coaches and periodization. I fondly remember when serious training involved “riding lots” and frequent riding miserable. We had a slogan about the benefits of long rides in the cold and rain – it made you tough and lean – and oh, both were so desirable (and indeed still are). However, although training has become more serious and regimented, I have become less, at least as relates to my hobbies. Over a period of time where training opportunities went from bad to worse to down right dangerous (I don’t recommend racing on 4 hours of sleep as a general matter) I kept my toes in the racing waters. There is a profound humility that comes from lining up with guys who are fit and focused when you are neither. Happily, life has a adjusted enough so that the squeeze on riding has relented significantly. Problem is that riding in the cold and wet has much less appeal to me. Consequently, both the Young Turks and the Old (but focused) Turks have been putting boots to me. And its actually fine with me. No doubt bikes are a passion for me – but in order of passion my bike-related interests go from riding, to bikes and tech and finally to racing. I am happy with that too, thought I continue to hope that the first will increase proficiency with the last. Time will tell. 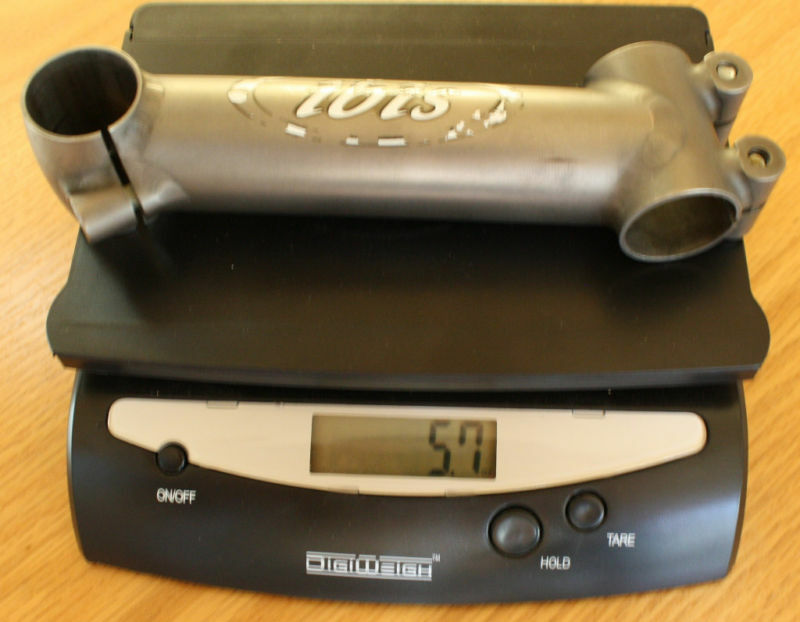 When Ibis started fabricating titanium, they went all out. Their work was amazing and at the time pushed the envelope for butting, tube shaping, etc. You can’t go wrong with classic Ibis Ti. Last week when I was on a ride I saw an older couple on an Ibis Ti Tandem. Sweet. No time for a pic sadly. 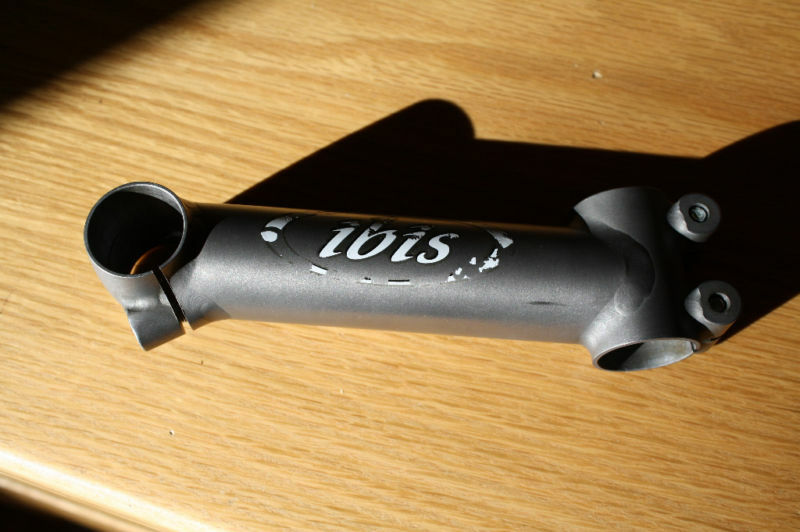 I do have some pics to offer of the Ibis Ti stem that is slated to go on my Ti Fat Chance. 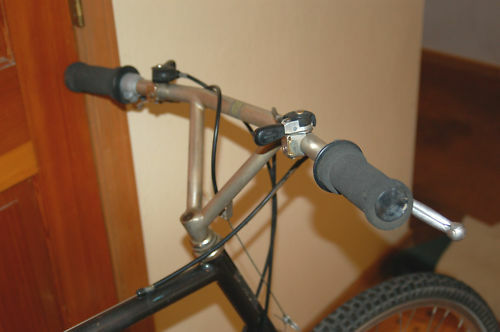 I received the replacement headset for it, so once I get some time this weekend, I’ll get some work done on that bike. 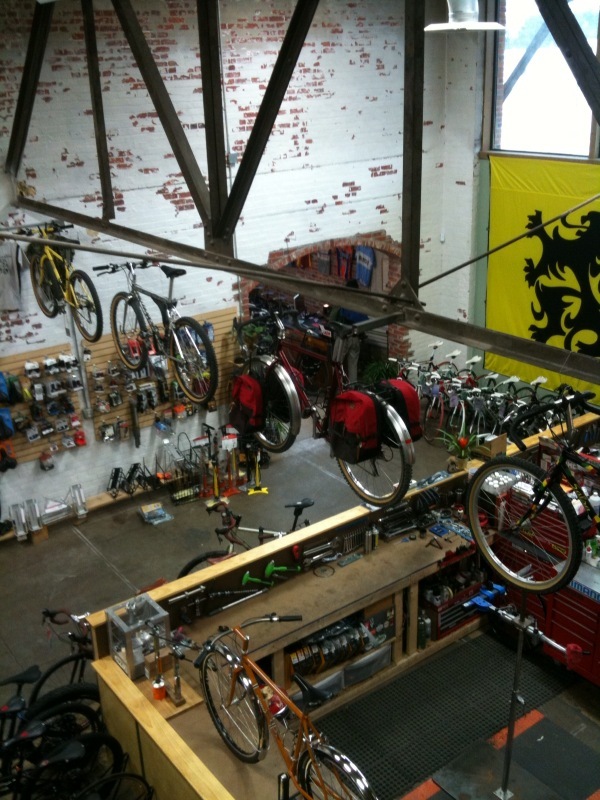 Got this cool snap from Monkey Wrench Cycles in Nebraska. Their new space looks fantastic. In the pic you can kind of make out my XCR with a Ken Beach (of Gecko Cycles fame) smoke finish and older style WTB roller cams. The red bike is a Sherpa in full, original, touring kit. It has racks by Bruce Gordon and these fantastic hand made panniers. Cool cool beans. Oh yea, you can also see a wicked Moots and a sweet (or spicy?) Salsa. I am a big fan of bike related … stuff. So, from time to time I will highlight items that I think are neat and provide some color on why I think that to be the case. I’ll start off with a potpurri. 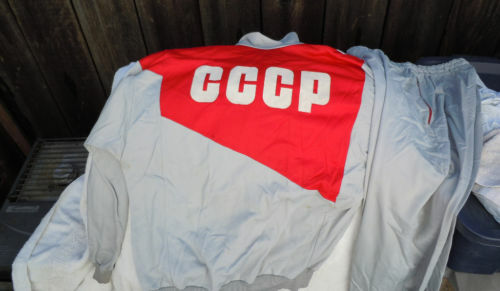 First up is a Soviet-era sports athletic warm-up/cool down suit. This is is the quintessential eBay find – it wasn’t too expensive and it is almost completely useless (and as a plus it looks bad too). The seller had received it in trade for his Team USA jumpsuit at a world championships sometime in the late-80s. 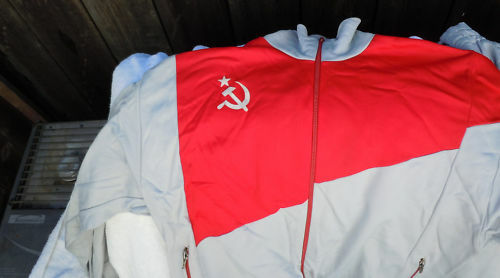 The suit is very comfortable with a soft fleecy interior to soften the harsh Soviet graphics. Next up is a 19990 Grundig World Cup sticker. 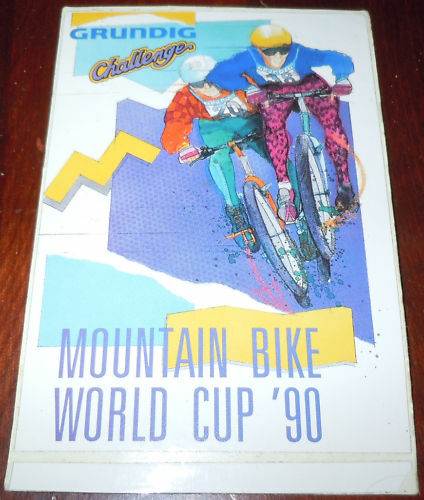 Recall that in 1990 there was an American MTB series under the auspices of Norba and a European MTB series under Grundig. Now everything is under the UCI and the rules are stacked against North Americans and in any case we lose at all the events anyway. When I was in Japan riding my Look 753 Hinault machine, I was distressed to find that the non-driveside crank tapers were messed up. 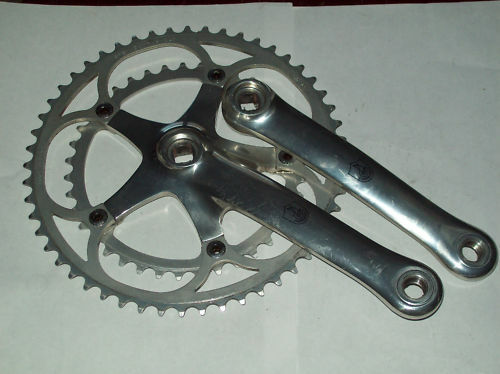 As a result, the crank creaks (no big deal) and loosens up every 60 miles or so (big deal) so I will be replacing the C Record cranks on the bike with these 1987 Chorus cranks. These are a little longer too – 172.5mm compared to 170mm so should do better from a leverage point of view as I am grinding up the mountains around Kansai. I will write more about 1987 Chorus later. I dig the group (or gruppo if you prefer). 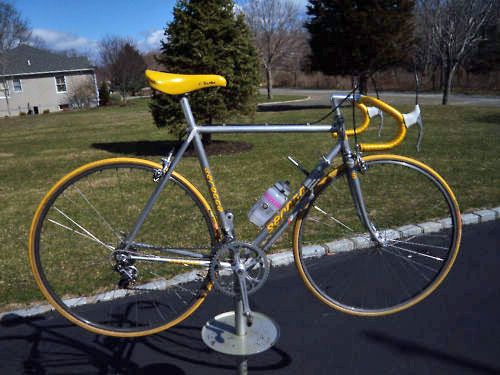 In the 70s, Alan made somewhat sketchy bonded aluminum road bikes. Very light, very … um, compliant. 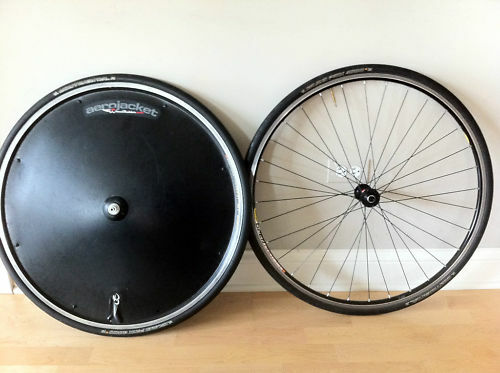 These Olympic has ultra-light Hi-E wheels (which are cracking at the spoke holes, but so it goes). Picture is kind of crap. 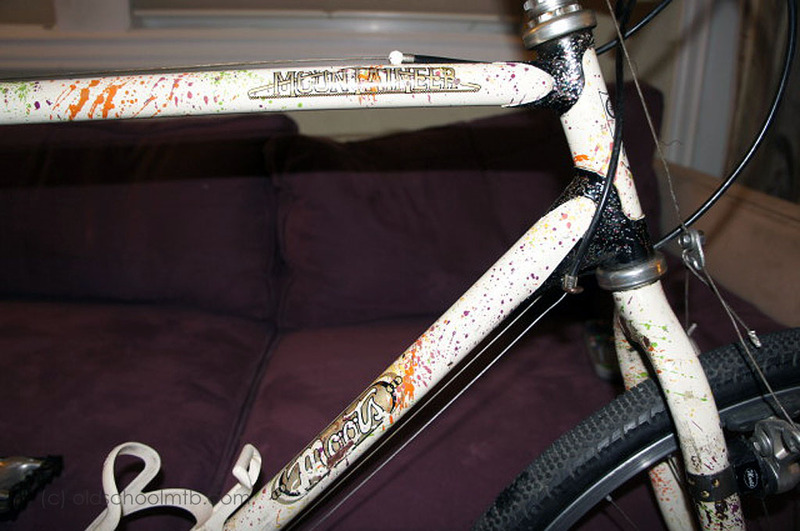 One of my projects, which I will detail later, is a Fat Chance Titanium from 1992 or 1993. 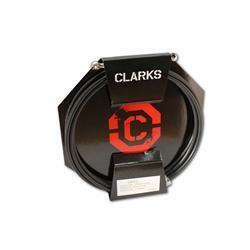 It is outfitted with Campagnolo Record OR, which used a micro-drive type gearing system. 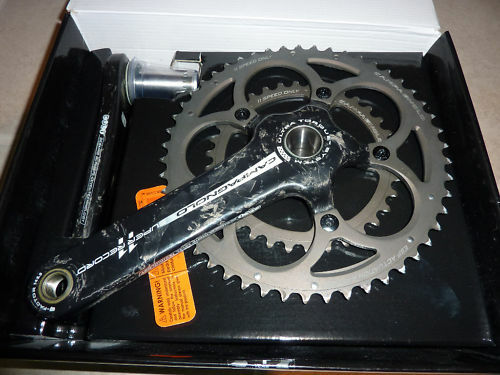 I figured it would be cool to make a more modern gear spread but using period correct bits, so I got this 8 speed Campy cassette to cannibalize – I put together my own ratios using some of these cogs and some cogs from a 12-23 road block. Finally, Andy Hampsten’s old Moots was available and I went for it. Wow. So sweet. More on this one obviously. 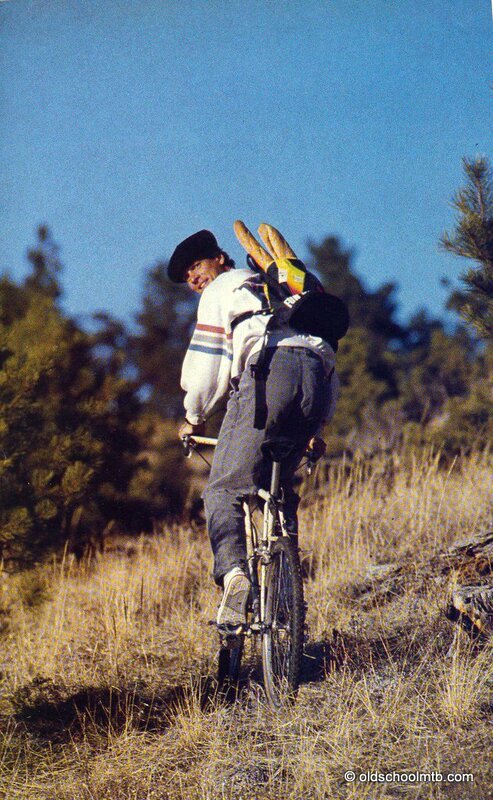 Here is a pic of Andy riding the bike back in the day.